Often the surface chart does not reveal the true potential of storm activity. The period of the 21st to 23rd November was very much a case. On the 20th a trough had moved through southern to central NSW, in its wake cooler S/SE winds had established, this is normally indicative of stabilising air. However over the next few days an upper atmosphere trough and cold pool lingered and triggered storms despite the less than favourable surface winds. The 21st saw cool S winds at my home. 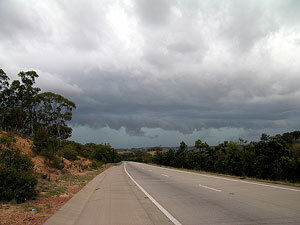 By midday storms had become widespread over the southern inland of NSW, which is just a little too far for a day chase. I decided to hit the road with the hope that they should develop closer as the upper trough edged eastwards. Just 30 mins from home and the top of the infamous Macquarie Pass was yet again clothed in low cloud and fog, visibility was about 15 metres ( 30 ft ) and there was drizzle. Conditions were very hazardous, not to mention time consuming. The fog lifted just west of Roberston, but low cloud and drizzle persisted. At Goulburn just east of the Great Divide the coastal influenced low cloud started to break to reveal struggling cumulus. The AM radio however was now quite active and indicated that activity was not that far off. Nearing the South West slopes town of Yass the SW horizon filled with a ominous green. 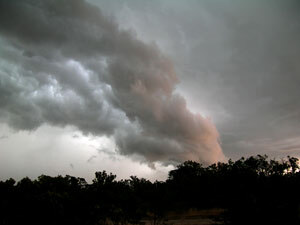 At this stage it looked very much like a squall line, not what I had planned. The storm was upon me very shortly, only time to snap a quick picture before I was engulfed in rain and wind. I backtracked up the highway in an attempt to outpace the storm. It took me the best part of 45 mins to achieve this, with most of that 45 mins spent in heavy rain and occasional lightning bolts. I headed to Crookwell were there was at last some clearing, but only to reveal low drizzly cloud and developing weak storms cells. Crookwell is about 300m higher in altitude to where I first picked up the original storm. Under the moist S/SE winds this rise in altitude was enough to change the surface weather to the low cloud and very much weaker cumulus cells. 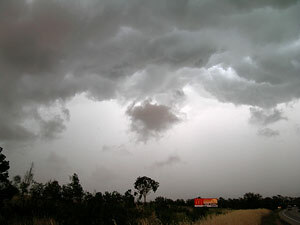 From Crookwell I followed what appeared to be clearer air northwards to Bathurst. It was and the road weaved in, down and around deep river valleys. Some nice looking cells developed east of the road, but they had no road options leading to them.